Learning from the mistakes and successes of an experienced educational leader. No one likes to think that something he/she started is going to go away after it’s rolled out. A school district owes it to everyone in the learning community to sustain an initiative over time until it is institutionalized in every classroom. 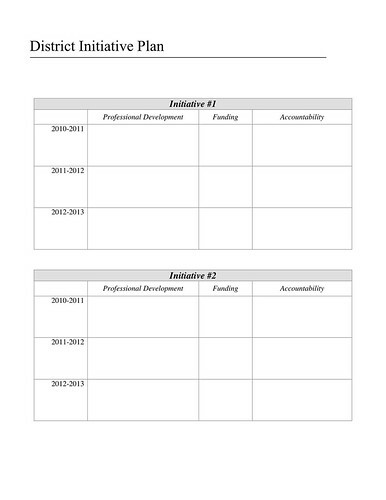 Initiative Plan to download as a PDF). Initiative planning should start with teachers and parents and culminate in the alignment of professional development, finance, and accountability via administration team-teacher collaboration. An effective initiative plan can frame the district budget, professional development planning, and the personnel evaluation system. True alignment of all parts of the school system to the initiative plan will ensure institutionalization of the initiatives on a comprehensive scale. Be sure to check in with the administration team every other month to assure the plan is sustained in an ongoing fashion. The plan should be considered a “living” process that can be updated as necessary (although consistency is key so changes should be infrequent).